Home / LP / Mocha Uson / Pres. Rody Duterte / Rappler / Sen. Kiko / Sen. Kiko Pangilinan / Sister Patricia Fox / Viral Stories / VOVPh / DDS Bloggers Lectures Sen. Pangilinan: "It Is NOT the First Time that Foreign Protesters Were Deported"
DDS Bloggers Lectures Sen. Pangilinan: "It Is NOT the First Time that Foreign Protesters Were Deported"
Numerous DDS Bloggers lectured Sen. Kiko Pangilinan for criticizing the decision of the Duterte administration to deport Sister Patricia Fox for allegedly joining various anti-government protest rallies as they reminded the senator that it is NOT the first time that foreign protesters were deported from the country. Senator Kiko Pangilinan, the President of the Liberal Party of the Philippines criticized the Duterte administration for deporting the aging Australian nun, Sister Patricia Fox from the Philippines. "This administration is deathly afraid of losing its grip on power and so even a 70 year old, ailing nun criticial of government's abuse must be deported." "Takot at kaduwagn at hindi tpang ang tunay na nasa likod ng mga kilos ng administrasyon laban kay Sister Patricia Fox." Popular Facebook Page VOVPh, slams Sen. Kiko Pangilinan by saying that he should join Fox on her journey to be deported also. 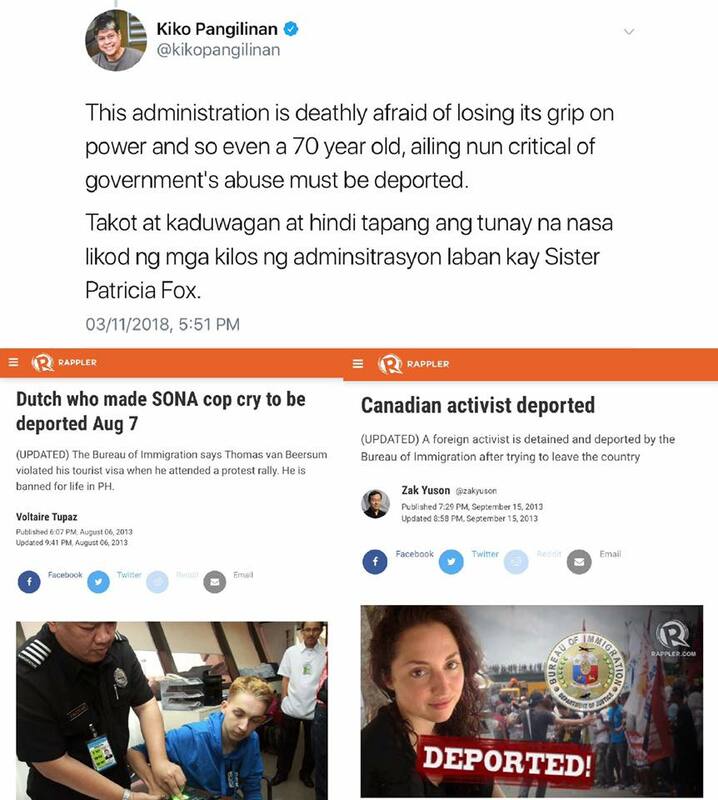 "Kiko Pangilinang bat di ka sumama kay Patricia Fox?" VOVph stated. The FB Page also posted some clippings showing news article from Rappler that proved to all Filipinos that it is not the first time that a foreigner protester was deported because of their participation in protest rallies against the government. An August 2013 article showed how a a Dutch protester who made a SONA Cop cry was deported by the Aquino administration. A September 2013 article also showed that a Canadian activist was also deported from the Philippines during the Auino administration for allegedly participating in protest rallies. The expose of VOVph was also echoed by Pro-Duterte supporter's pages and Facebook Groups. One of the country's most popular blogger, Mocha Uson who is running for an elective position as partylist representative of AA Kasosyo Partylist also criticized Sen. Kiko Pangilinan by saying "Pag dilawang opposition BOBO talaga. Basta maka kontra lang kahit nagmumuka ng tanga ok lang." Joe O'hara: @kikoKupalPangilinan Hindi sila ma deport Kung di sila nakisawsaw! Animal ka ! Punta ka ng Saudi or ibang bansa makisawsaw ka sa goverment nila kundi ba tuklapin nila yang eyebag mo! Toto Labis: Tangang Matsing kiko pangjilinan over stay na yan sa Pinas si fox ikaw punta ka sa Australia mag over stay ka doon tignan natin kung hindi ka ba kaladkarin papuntang airport na nka posas sabagay onggoy ka nga pala ilagay ka sa cage at dalhin sa zoo abogago kang BOBO. Merlyn Biscocho-uy: Gago itong senador . How can you be mean to the phils.kiko pangilinan? Your task is to defend the constitution of the land. Mas pabor ka pa sa dayuhan. What a bs mind you have..you are not worthy to be a filipino!